Irwin County Hospital in Ocilla, Georgia is one of many rural hospitals in Georgia in financial need. On a recent afternoon, the emergency room at Irwin County Hospital is empty except for one patient. He’s propped up on a bed and strapped to a machine that monitors his heart rate. Nurse Jason Baxley works the shift. “Our ER is not very large. It’s only four exam rooms, a cardiac room and trauma room,” Baxley said. While it isn’t very large, Baxley said the emergency room stays busy. By around noon, they’ve seen a handful of patients – some for pregnancies and a couple others for broken bones, he said. On a 12-hour shift, he said the emergency room sees seven to eight patients on slow days to 12 to 13 patients. “We treat anything from common colds to cardiac arrests,” he said. Irwin County is about a three-hour drive from Atlanta down I-75 and has a population of about 9,000 people. But the hospital delivers babies from around the area, about 400 a year. “If we’re not here, people die, and that’s something that we live with every day,” said Clay Jones, regional director of operations for E.R. Hospitals, which manages Irwin County Hospital and four other rural hospitals in Georgia. Last year, Irwin County Hospital was about $2.5 million in the red, hospital officials said. Irwin County Hospital recently topped a state list of rural hospitals in need of financial help and is one of dozens in Georgia trying to stay afloat. According to the NC Rural Health Research Program, six rural hospitals in Georgia have closed since 2010. Jones said one reason for the shortfall at Irwin County is that people who come in often don’t have insurance – and even if they do, they can’t meet the high deductible. “Our emergency room doesn’t make money because a lot of people that come to our emergency room just aren’t able to pay in rural markets,” Jones said. The Affordable Care Act was supposed to help by insuring more people, but Georgia and 18 other states did not expand Medicaid, which would have covered more low-income residents. At the same time, rural hospitals were also having to meet requirements imposed by the ACA, like digitizing medical records, said George Pink, director of the NC Rural Health Research Program at the University of North Carolina Chapel Hill. Rural hospitals also treat patients who are often older and sicker, he said. “I mean, there is just a lot of different things happening all at the same time, and this has put enormous financial pressures on rural hospitals,” Pink said. Nationwide, 80 hospitals have closed, and almost half of all rural hospitals are currently losing money, Pink said. Hospitals have also been getting paid less from the federal government for Medicare, and that’s hurt rural hospitals, said Maggie Elehwany, vice president of government affairs and policy at the National Rural Health Association. She said she hopes Congress will step in and help. “I think we saw maybe the reflection of this last election that, I think, rural America has felt a little bit left out of many things lately,” she said. As Congress looks to replace the Affordable Care Act, she said she’d like to see a focus on the rural hospital closure crisis. 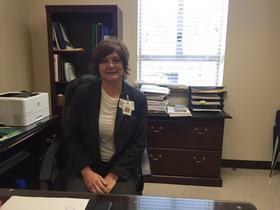 Paige Wynn, Irwin County Hospital’s chief operating officer and chief financial officer, has been working to keep the 34-bed hospital operating. “We’ve done about all the cutting that can be done, so we’re there,” Wynn said. While other hospitals get county support, Irwin County Hospital currently does not. Last year, she said the hospital had to lay off about 20 staff members. 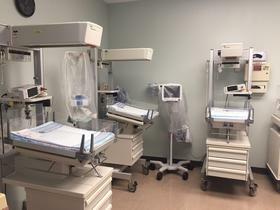 Irwin County shares some expensive equipment with another hospital in the neighboring county. The hospital currently does not have an MRI machine. That means back at the emergency room, nurses prepare to transfer the man who’s suffered a possible stroke to another hospital that has an MRI machine. “It’s going to be very important that we get a long-term fix. We are still bleeding,” Wynn said.